Whenever I list people who are icons of fashion — at least the people wearing it, not so much those designing and making money off of it — I can only think of women. This is a huge testament to the intelligence, artistry, and fearlessness of women, who proudly bear outfits that redefine how we present our bodies and how we express ourselves through what we wear. Because of how much more women do with their clothing and fashion, men often don’t care to share this interest, seeing it as emasculating or feminine. But it’s neither of these things, and it’s disappointing just how common this attitude is towards fashion. The belief that men will lose their masculinity if they want to enjoy fashion seems particularly common in pop culture. It’s especially clear at the Met Gala, an annual event hosted by Anna Wintour, the legendary editor-in-chief of American Vogue, with a unique fashion theme for the musicians and actors in attendance to follow. It’s an opportunity to wear something fully original, allowing the guests to resemble pieces of art. The biggest moments of the Met Gala have almost exclusively been from the iconic looks of women. In 2015, Rihanna arrived to the Gala wearing a beautiful golden dress by Chinese designer Guo Pei. That same year, Beyoncé stunted at the Met Gala when she arrived on the red carpet wearing a beautiful jeweled and transparent dress by Riccardo Tisci. Meanwhile, just last year, Zendaya wore an incredible armor-inspired Versace design by Law Roach, embodying Joan of Arc and standing out from the dresses of the other women. However, every year, men seem to arrive at the Met Gala wearing plain reiterations of a suit and tie. In contrast to the pieces of art women wear, men seem to arrive at fashion’s biggest night without placing any consideration into what’s on their body. Even though they have the same red-carpet walkway, the men never seem to push the envelope at the one event where envelopes are meant to be pushed. It’s almost as if they know that the second they dare to dress “outside of the box,” their masculinity, along with their fashion, will fall under great scrutiny. This is something I’ve seen as much in personal life as I have in celebritydom. One day, I wore a pair of blue Jordans with blue shorts and a blue basketball jersey. I also had on a blue beanie with the number “1994” across the front it. It was a simple outfit. It was the beginning of summer, and since we were entering one of my favourite seasons, I decided to exclusively wear my favourite colour and was proud of my outfit. But later that day, I vividly remember three of my coworkers standing right in front of me, glancing my way and laughing. I gave them a confused look, and one of the leaders loudly told me that I was “doing too much,” and that I should “dumb down” my fashion choices. So, for the rest of the summer, I dressed the way people in my workplace expected men to: like they woke up in the dark, found whatever was lying around, and hoped nothing had a stain. But with the power and personality clothing gives us, I’m disappointed how few men want to have an outfit that means so much more. This stigma towards men caring about style is certainly changing, thankfully. 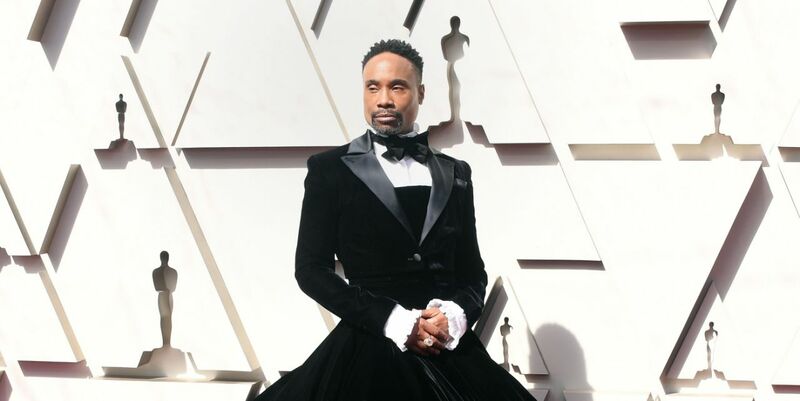 Billy Porter’s outfit at the 2019 Oscars, a beautiful black gown with a tuxedo jacket, reminded me that men are certainly able to make bold fashion statements. People ended up taunting Porter online after the awards ceremony, but he remained victorious as one of the most iconic looks of the evening. It was a reminder that men can celebrate the freedom of fashion without allowing it to define their masculinity. Fashion is different for everyone. Everyone has their own style, and should never be afraid to showcase it. Moreover, men need to stop buying into the notion that fashion is only an outlet for women. If you’re a man who’s just not “into” fashion, that’s cool. But if you’re a man who isn’t into it because you find it emasculating, or don’t understand what you can do with it, then you should reevaluate why you feel this way, and what it says about how you perceive femininity.